Native American art history has developed over thousands of years and consists of several distinctive styles from the distinguishing cultures of diverse Indian tribes. From Navajo to Hopi to Plains Indians each tribe has a unique history, which consists of many types of Native American Indian arts including beadwork, jewelry, weaving, basketry, pottery, carvings, kachinas, masks, totem poles, drums, flutes, pipes, dolls and more. Native American arts have an extremely deep connection with spirituality and Mother Nature. It’s a profoundly expressive art that has been a way of life for many Native Americans. Native American art history can be traced back to cave painting, stonework and earthenware thousands of years ago. Over the years the types of materials used by Native Americans has evolved from rocks and feathers to cloth, clay, turquoise, silver, glass and fabric; each piece of art reveals intricacies of the diverse indigenous people. Native American art history is strongly associated with symbols that were often linked with nature. Important symbols in most Native American art history include the sun, moon, bears, eagles or people. Pendants and statues were often created to symbolize and honor Mother Nature. Everything Native Americans create is done with time and care so that even ordinary utensils are often considered pieces of art. Tall wooden sculptures known as totem poles are one of the most elaborate forms of Native American art. Each pole represents generations of family members or spiritual story. A lot of totem poles would include characteristics of animals, considered spirit animals, standing as a symbol of Native American heritage. One of the more popular forms of Native American art is jewelry. Rich in symbolism and used to adorn, protect and in some cases honor, Native American jewelry is one of the most sought after forms of Native American art. Known for their skills in carving intricate designs and patterns, often Native American inspiration came from the natural world. Most commonly used materials for Native American jewelry is silver, turquoise, onyx, copper, opal and brown stone. 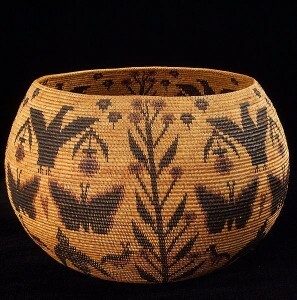 Southwest Indian artists are best known for kachina dolls of the Hopi; sandpaintings of the Navajo; pottery, particularly by Pueblo Indian artists; woven blankets and rugs predominantly by the Navajos; and many different styles of fine basketry and jewelry particularly in silver and turquoise jewelry. Over thousands of years Native American art history has evolved from cave drawing to ornate jewelry, basketry, pottery and blanket design. The next few pages will discuss Native American arts, Native American Indian art of the Southwest and Native American culture facts. Copyright © Native American Art History 2019. All Rights Reserved.